How do cats bond? What can we do to let the cat know we love them? How can we know the cat loves us? One of the beautiful things about cats is how they love us exactly in response to how much we love them. 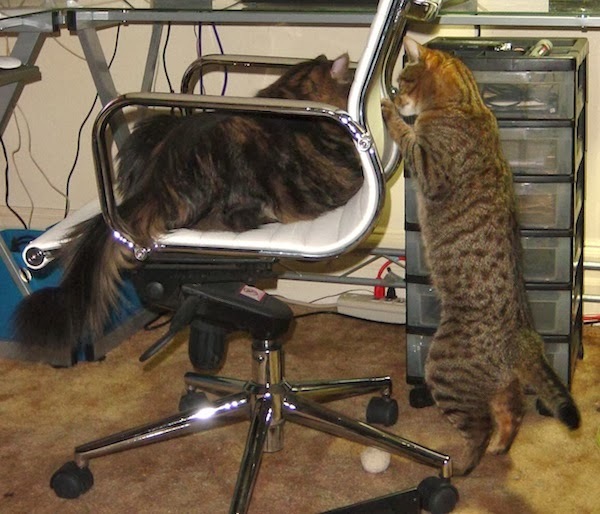 Unlike dogs, who have a hierarchal social structure, cats have social reflexes which operate reciprocatively. In other words, cats treat others exactly how they have been treated. If we act like we care that our cat's needs are met, if we act like we want our cats to see us as friends, if we respond as though our cat's feeling have meaning to us... our cat will get the picture. They will figure out that we do love them. In my experience, this is unique in the pet kingdom. Other animals will understand that our commitment to our experience is in proportion to what they bring to the experience. Other humans might lag behind in that understanding this transaction. But, nonetheless, cats realize that our care equals our caring. When we are able to successfully convey to our cats that we care about their welfare, they will be able to understand and reciprocate. For help with connection with our cats, see Cat Affection Move: The Love Blanket. Sometimes, we shouldn't get one kitten. We should get two! Who would they play with if each were alone? When we are starting from scratch, and have no cats. When our present cat is too old to keep up with a kitten. When we have chosen a kitten who needs close companionship. There are many shelters who encourage double adoptions, from offering a discount for a second cat to making sure cats leave the shelter in twos. It's not just finding twice as many homes. It's much easier to get our cat's playtime and social needs meet when they have each other. This keeps our cats friendly and social with humans, too. Some cats enjoy their solitude. But some cats really need lots of fellow cat playtime, like Alphas, or need a cat friend, like a Beta, or can use the reassurance of a fellow cat, like a Gamma. If we are going to enjoy cats, we are going to want more. So getting cats two at a time create less friction and more fun... right from the beginning. 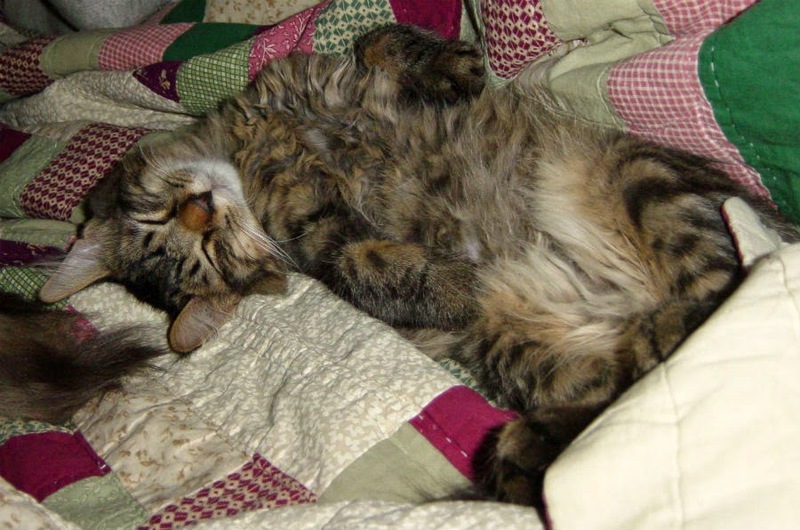 To revitalize an older cat, or resolve a two cat conflict, Third Cat can be magic. For an example of how this worked for a reader of mine, see Dear Pammy, It’s true about Cat Civilization. Do cats see us as big cats? Yes, they probably do. And we, sometimes. see our cats as small people, don't we? Tristan will watch a movie. Without fish. As seen at right, my cat Tristan is watching The Beast With a Million Eyes. It's not a a very good movie. 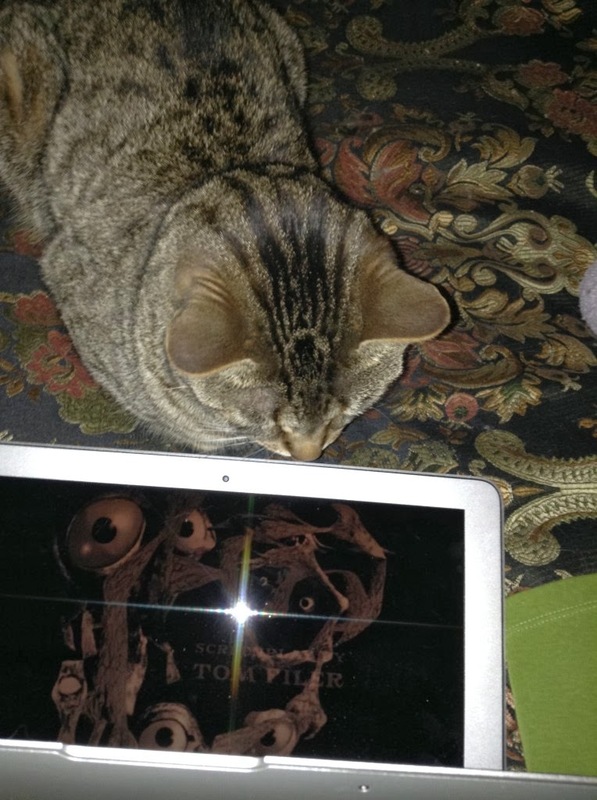 It's also not a movie we would expect a cat to watch, being as it's not starring any fish, birds, or small rodents. Tristan is also a talker, who asks for my attention with different "things" he says. When he wants to play on our apartment staircase, and then wants back in, he'll ring our hanging doorbells to let us know. Certainly, Tristan can communicate his wishes, and he is a quick learner. It only took me showing him the bells twice for him to learn they would open the door. I don't see his accomplishments as that different from a small, human, child. He asks for food and amusement and reassurance and for new things to be demonstrated to him. When I'm not feeling well, he turns the tables, and tries to take care of me. But in many ways, we are not that different. For more, see Points of Engagement.